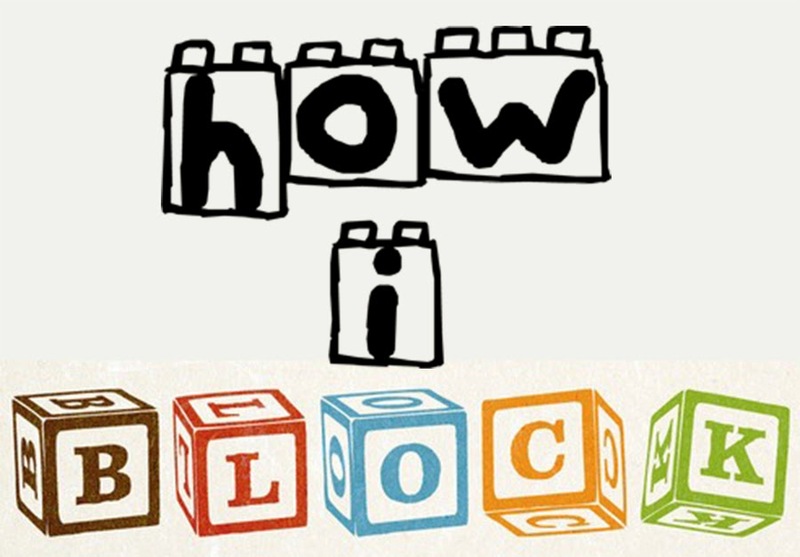 I've gotten a few questions about my blocking process, so here we go. For those of you who don't know, blocking is a way of pressing out knitting when it is done. It is essential for a good-looking knit. There is no wrong way to block! This is just how I do it. If it's knitted flat, I block before seaming and before any collar or button band. I don't weave in the ends that will be near the seam, because the seam will be a nice place to hide them. Once my knitted flat pieces are seamed after the first block, I knit the collars and button bands. In a second blocking session, I block only those. 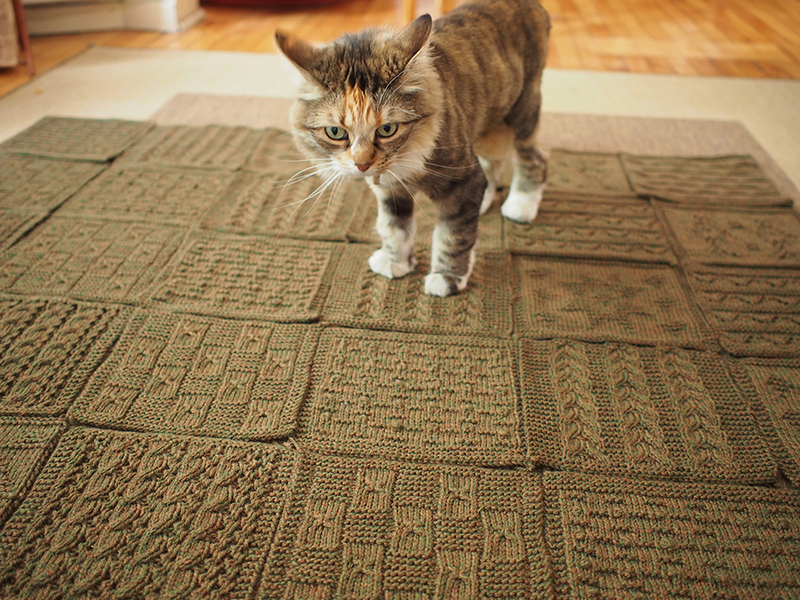 If it's knitted in-the-round, I block only after I've finished the entire garment and woven in the ends. To block something, you need to get it wet in some way. I always start by pinning my pieces out dry. I have found that if I soak a piece before pinning, it stretches unnaturally and is hard to maneuver or keep symmetrical. EXCEPTIONS (see below): Circular knits, pieces that are way smaller than you want, 100% acrylic. 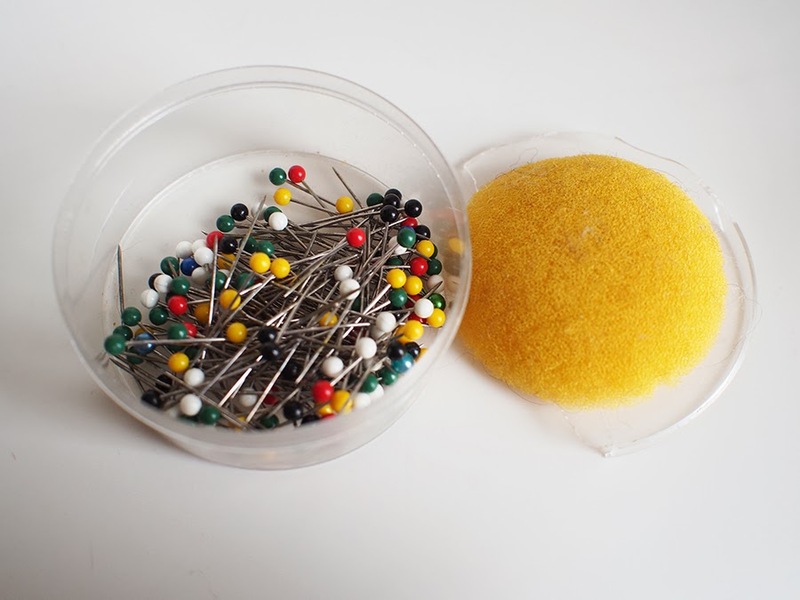 Use strong pins with nice round heads. Made sure they don't rust! Don't say I didn't warn you. T-pins are nice, but I find they are quite tough and you need a really good blocking surface because they are so thick. 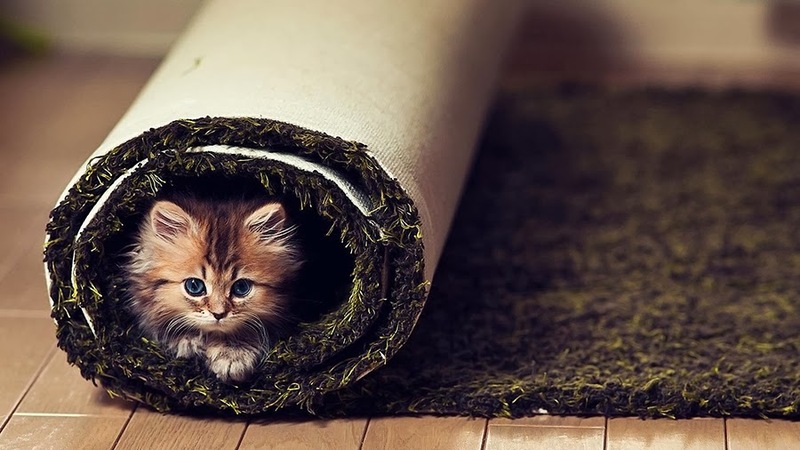 I pin onto a thin sisal living room rug. You can use anything soft and flat that will accept a pin into it and keep it there. Got your attention there, didn't I?? 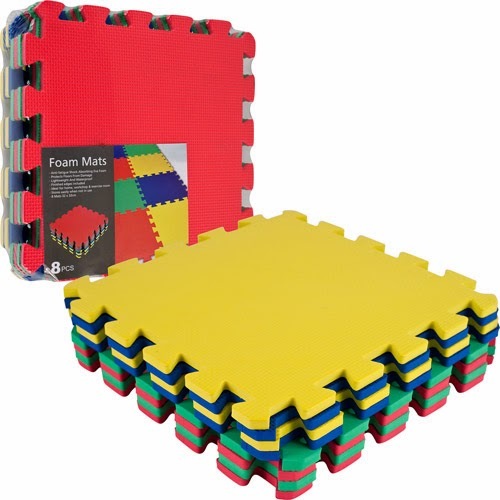 I should get me one of those puzzle piece mats that are popular for blocking, because you can store them. 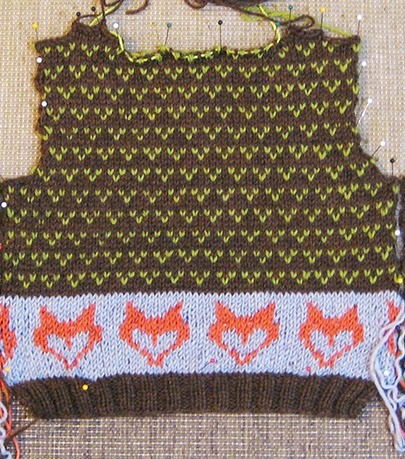 When pinning parts that curl (like stockinette pieces), add lots and lots of pins to avoid a scalloped edge. This is my Buckland, read more here. For parts you want to stretch the bejeebers out of (like lace), put your pins in diagonally, opposite to the direction of stretch -- they'll never spring out. This is my Strawberry Collar, read more here. This is my Sequin Stellaria, read more here. Avoid pinning ribbing -- you want it to remain stretchy, not be blocked out and floppy. You can see here that I pinned just to keep the edge down, but didn't touch the ribbing and let it hang naturally. This is my Foxy Friedrich, read more here. Spray with a spray bottle. I make sure to completely soak the edges/hems/collars, but only lightly spray the interior pieces. My trusty dollar store spray bottle, it must be seven years old. 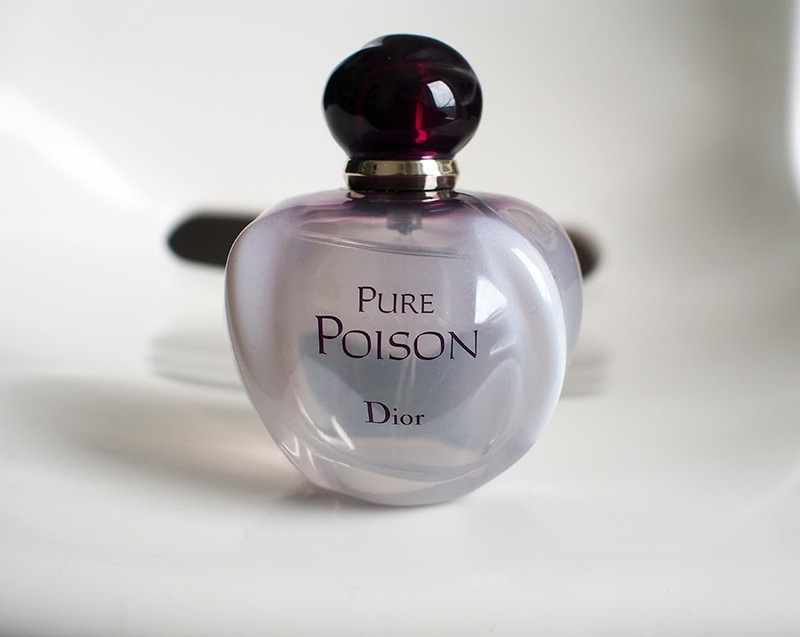 If you'd like some scent, add a spritz of your favorite perfume. 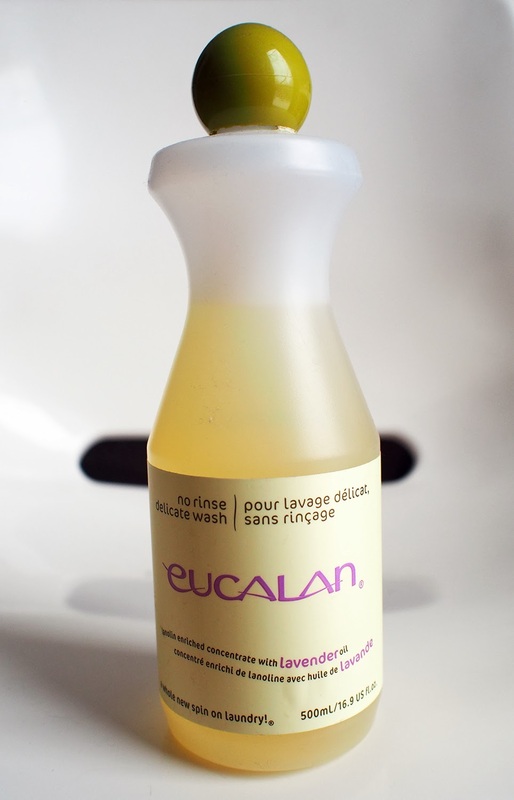 If you'd like some lanolin support for your wool, add some no-rinse wool wash, like Eucalan. 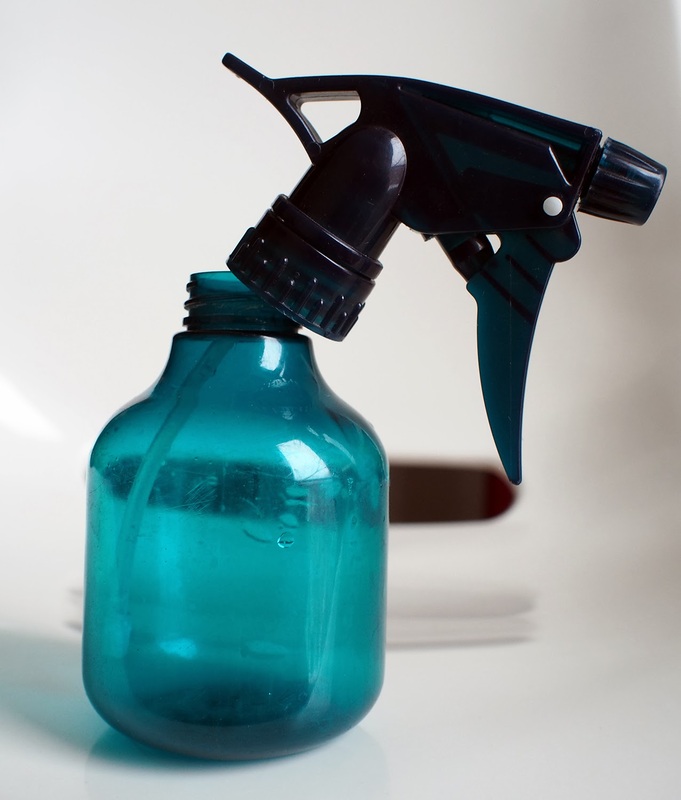 Your spray bottle will get foamy inside, so you might have to release the air once in a while. Wait until fully dry. It should come off the blocking surface like a smooth piece of cardboard, all stitches even and flat. Technique #1 breaks down with circular seamless knits. You can't ever spray the bottom side as well as the top, so you might as well soak the piece first. 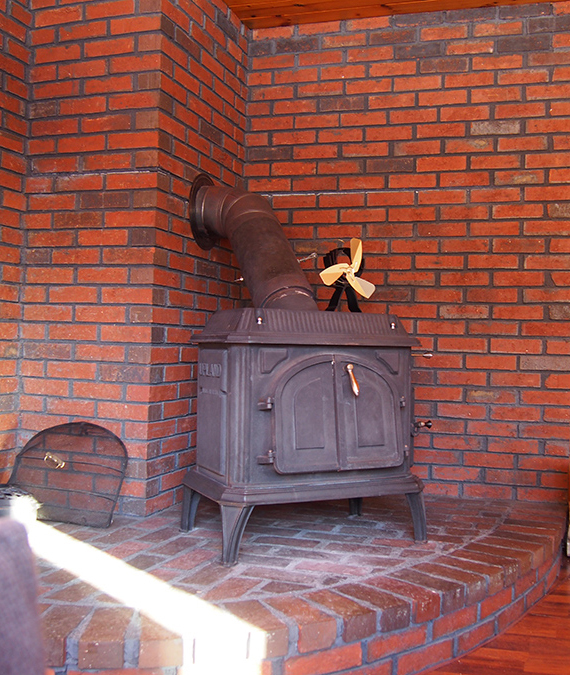 You can use a wool wash or just cool water. Wring out the excess in some towels and pin it out as symmetrical as you can, avoiding stretching it unnaturally. This is my Anatolia, read more here. If it's alpaca or superwash wool, be especially careful with stretch (it will not go back). I try not to use wool wash in these cases, it makes the fabric even softer and stretchier. 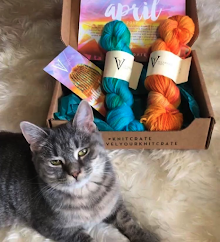 I had a near disaster with my madtosh merino light Hair Cell Sweater, read more here. Sometimes you just need something yesterday. A gift, a deadline, a party you simply must wear the cardigan to TONIGHT... 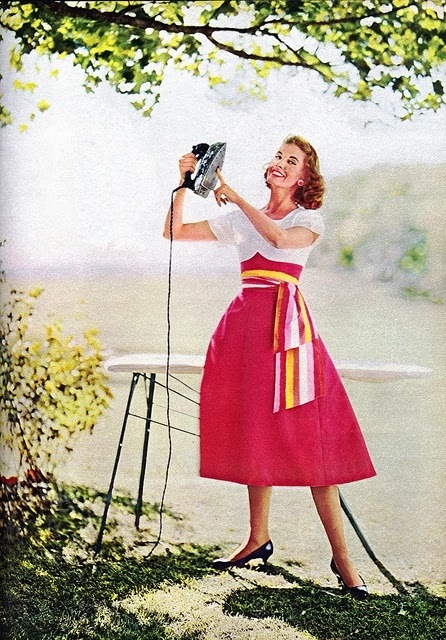 In this case, take out your steam iron. 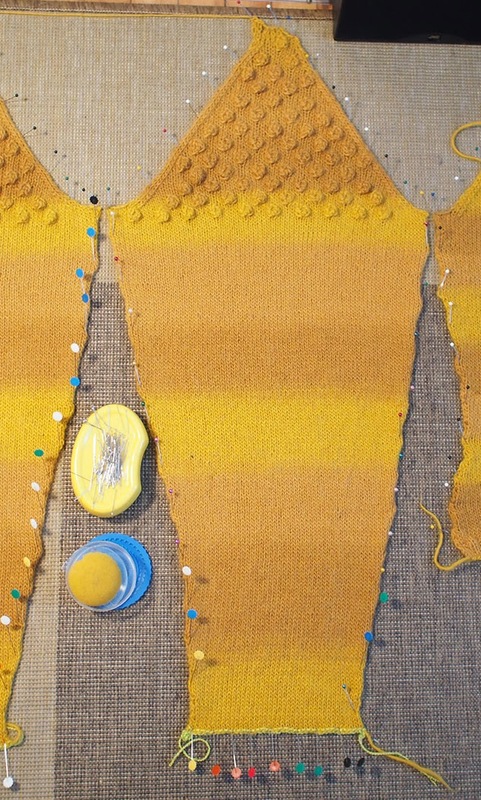 Pin out your pieces dry, angling the pins outward so that you have full access to the wool. 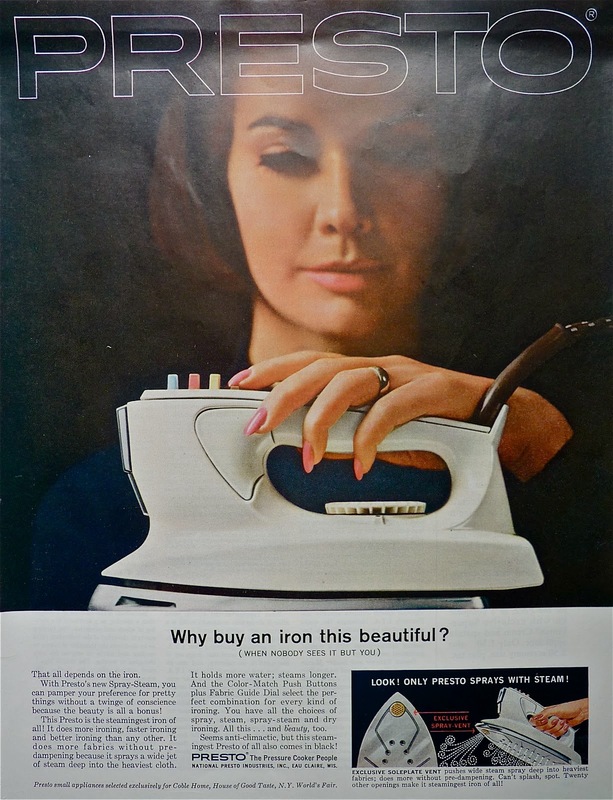 Fill the iron with water, set it to it's steamiest, most romantic setting, and slowly hover the iron over your piece, letting the steam get into the fabric. 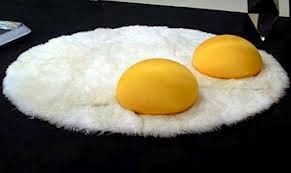 After I have steamed for awhile, I lay a towel over it to let it settle, cool and dry. It won't take long -- just enough time to finish up your make-up for the party. ;) Use this method especially for hard blocks (stretching to force a larger piece) or 100% acrylic and get the fabric really hot. Steam blocking does a good job, but never as complete and lovely as a good long wet block, in my opinion. Click here to tell me how you like to block! Excellent advice. I've done them all, but must admit my favorite is to steam block on the back side! So quick! Tell me, do you ever touch the fabric? It makes my work look professional and I like that. Exactly. Also, some types of knitting require it -- like stranding 2 colors or lace, it just looks all uneven until you block and then the real beauty emerges. I'm currently crocheting with silk with woolmix in a pattern with stripes. It curls like hell, so I block as I go. Knitted or crocheted silk can only be blocked when it's dry as you pin it down. Then spray with water and let it dry (your # 1 method). 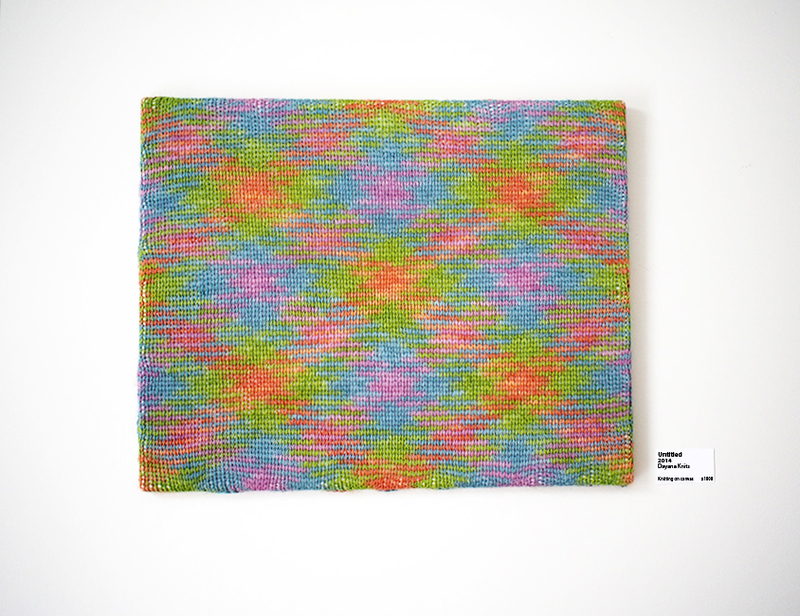 See my blogpost if you like: http://nellekemaaktvanalles.blogspot.nl/2014/02/block-as-you-go.html. Did you ever block knitted silk? Thank you so much for your blog link! Very cool. I haven't EVER knitted with silk, can you believe it? There is a new Rowan silk yarn I am using, but it is integrated with many other fibers. I need to try it all alone. So, i have a question: When you block your work, it remains blocked for life or you need to block it again after each wash ? This is a great question -- eventually you have wash your knit, obviously. The good news is that once you block your knit, your stitches will even out permanently. What will NOT be permanent is the shape. 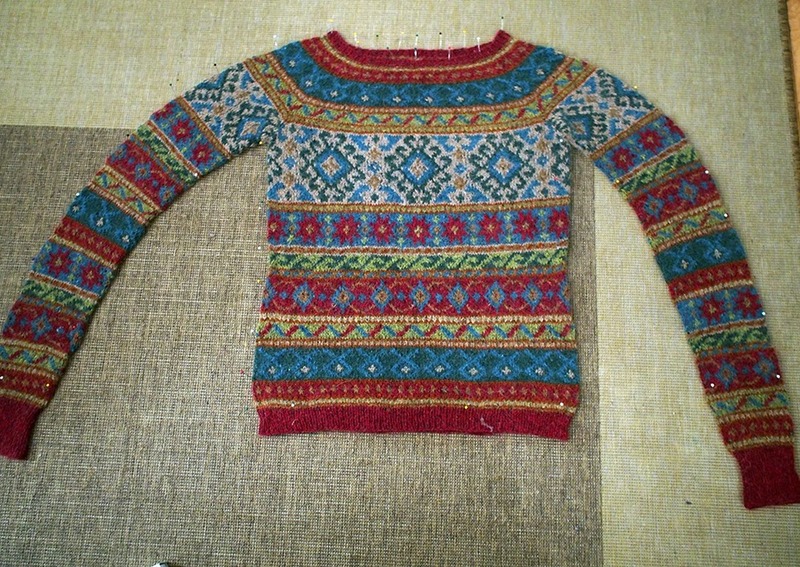 For sweaters, you can pin them out or just lie them flat, like you would care for a commercially-bought sweater. But for lace shawls or things with curling edges (like a scarf or collar), you really MUST pin out those parts or they will not look good after the wash. Thank you for the reply! 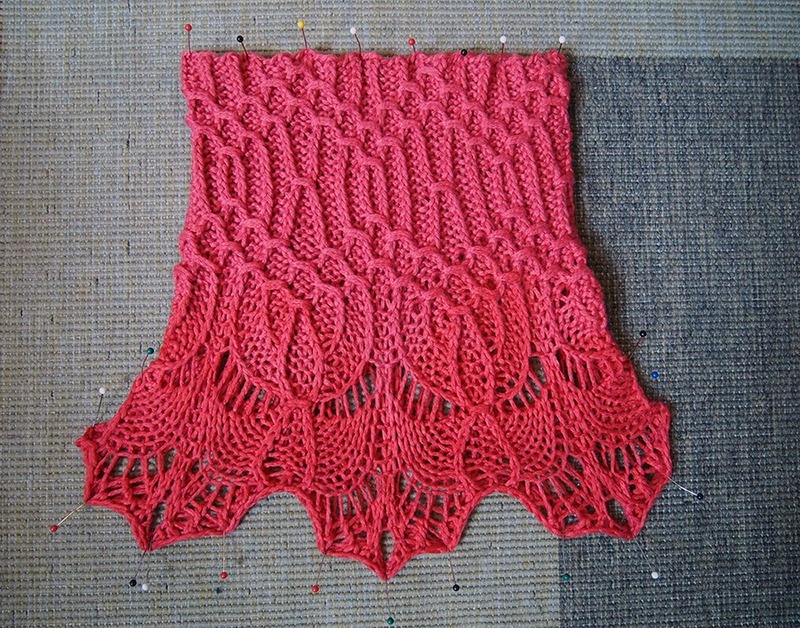 In fact my sister asked me a lace shawl and as I've never ventured into this kind of work. Some are fabulous, but with spikes ... so I will take special attention! 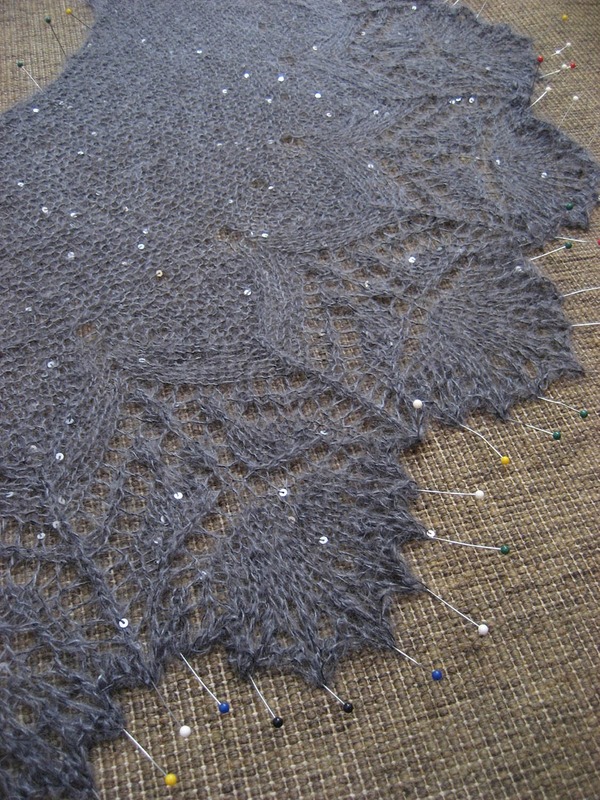 I I block some simple shawl (Boneyard of Stephen West) and that stay large...but never try lace ! For a little more flexibility, I tried with a yoga mat ... it was difficult to properly focus and convince them to stay there in the same time! lol ! Sorry for off topic and sorry for my english too ! Thanks for the great tip on pinning lace diagonally! I will have to try that! I used to use a mattress as a blocking suface, but just switched to the puzzle piece mat, and so far so good! It doesn't take pins as well, though, as a rug or mattress would. Dayana, great advice, I was so intrigued with this wet blocking. 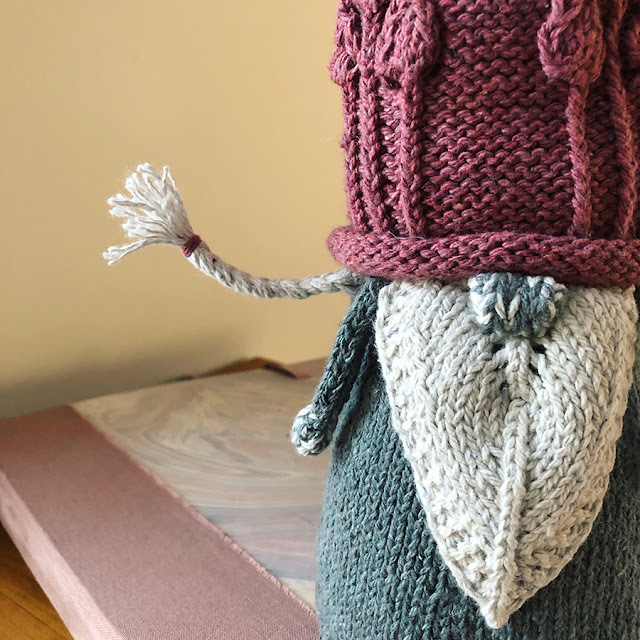 I'd never heard of it till joining Ravelry. I've always steam blocked. It is the only method that was given in all patterns in the UK. I love steaming, it's quick and easy. I do it on the back side of the work and barley touch it with the iron. You can smooth out the curling edges with an iron very easily, although I do pin the piece out first. I do this on my ironing board, so I have to do it in sections. I would love to try those puzzle pieces so I can lay the work out in one go. I'd love to hear your results! One thing I love about wet blocking, which I never seem to really achieve with steam blocking, is that when you lift the piece it is like the flattest, smoothest piece of cardboard. The transformation is astonishing!